It’s been awhile since I’ve done a treasures post. 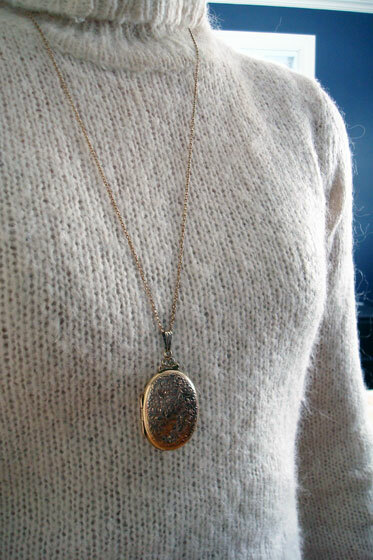 Last week, I wore one of my most precious treasures, my grandmother’s locket. Like most of my treasures this is inherited from family. I don’t know the exact heritage of this locket but I can see its history just by looking at it. The back and front both have several dents. My Mom’s memory is that my grandmother was wearing this one day when she fell down the stairs while carrying my Mom. My Mom was tossed through the air and somehow ended up landing on a pile of towels in the linen closet. My grandmother was also alright, but the locket was dented. 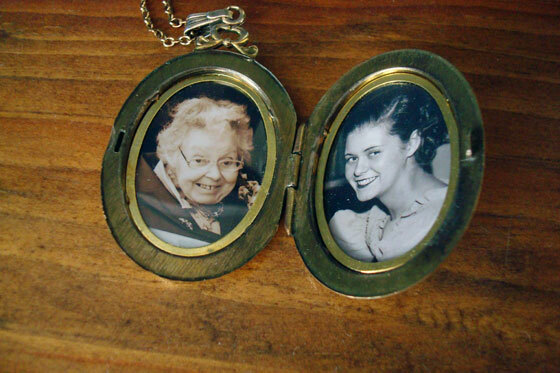 Inside the locket, I’ve placed my two favourite photos of my grandmother: one from Matt’s and my wedding and one from when she was a young woman. 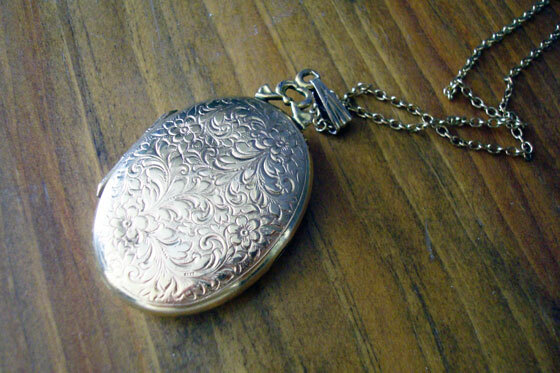 I always wanted a locket, so I was really honoured to inherit this one from my grandmother. When I wear it, I find myself opening it every so often to look at the photos and remember her. Thanks for commenting, Molly. “Precious” is a great way to describe most of my treasures. I guess in some ways the two words mean the same things! What a beautiful and wonderful piece to cherish !! Your grandmother was a lovely lady and I know you remember her fondly. 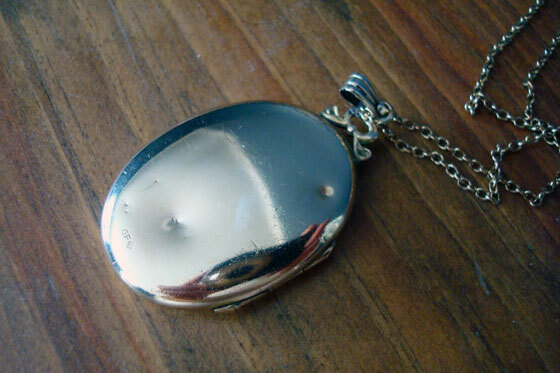 I also have a locket; unfortunately, it is not an heirloom. However, inside I have pictures of my mother and aunt when they were youngsters and I, too, look at them from time to time and have fond memories of both of them. I was fortunate enough to have “two” mothers — my birth mother and later, my aunt. Thanks for sharing such a beautiful piece. That’s a wonderful way to commemorate your two mothers. What lovely memories. I just love your locket! Especially because it means so much as an heirloom! I have my grandmother’s tiny little cameo. My aunt had it made into a ring for me. Other than my engagement ring, it is the most important piece of jewelry in my house! I love that you have a heirloom that’s been transformed into a piece that works for you. That’s a great way to have the memory of your grandmother live on. Aww, that is so sweet and special. I’m so glad you have that locket. My grandmas are so special to me. One passed away a few years ago and one is still with us and doing well. I know I am lucky to have known them both. Grandmas and the memories we have of them are special indeed. That’s a lovely locket. I really like your treasures posts! It’s so cool that you honour the past and keep it with you in your special possessions. Thanks so much, Jan. I’m pretty sentimental. 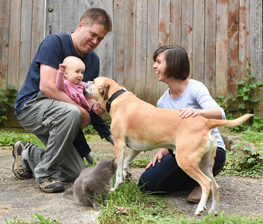 It gives me an extra level of enjoyment of family and my past.